May 13, 2015 – I had the good fortune to see the Waterboys this past Wednesday at the Fonda Theater in Hollywood (Thank you Goldenvoice). While I am familiar with their music from 30 years ago I admit I have not kept up with the band too much. It was not until a very good friend passed away last year that I began to revisit the band’s music because of his love for the band, and as is my way I was playing tributes on the Flying Eye, and the Waterboys became a new staple. Their music has been evolving unbeknownst to me. Mike Scott has kept things going in a fantastic way. If you recall the early sounds of the band it was heavily flavored with the an Irish sound, that has now given way to a much more wise ranging sound. 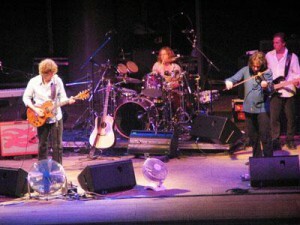 The current band, which boasts an alumni of over 70 musicians, is lead by founder and clear front man Mike Scott – vocals, guitar, piano, longtime member Steve Wickham – electric fiddle, mandolin, Ralph Salmins – drums, Paul Brown – keyboards, backing vocals, Zach Ernst – guitar and David Hood – bass. The band was quite tight and the crowd were clearly there for them, with many in the crowd actually dancing, a phenomenon rarely seen. In January 2015 the album Modern Blues was released and they ran through several cuts including “Still a Freak” and “I Can See Elvis”, both of which were featured just this week on Music Gumbo and Monday Music Massage (http://archive.flyingeye.com). The new music is excellent and offers a wide range of sounds which is something I personally find appealing. As an added bonus the opening band Connor Kennedy & the Minstrel was outstanding. They have a album of live music which I managed to commandeer. You will be able to hear their music in the upcoming weeks here on the Flying Eye Radio Network.